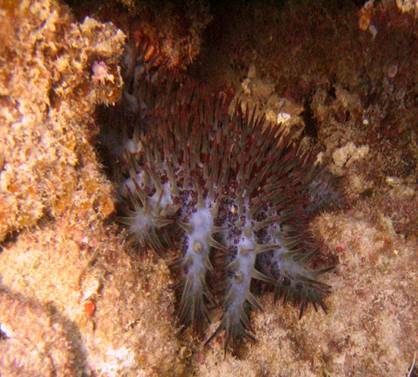 Identification: Benthic organisms, red echinoderms (starfish) with armored with thorn-like spines that grow up to 40cm. They live in sheltered areas of reefs and lagoons. They have 12-18 arms extending from the central body with muscular tubed "feet" along each arm that function for to move them across the ocean floor as well as for food gathering and gas exchange. Crown-of-Thorns reach sexual maturity at the end of their second year, female egg production increases with size. An adult female CoT can produce 60 million eggs per spawning. They reproduce sexually once a year in midsummer by releasing eggs and sperm into the water column that combine to gametes that develop into free-swimming larvae that swim around for two to three weeks before they then settle on the ocean floor. A solitary nocturnal feeder, they feed on reef building coral polyps and take shelter under corals during the day and can live for up to nine months without feeding. Epithelial cells on the long thorns can release a toxic chemical (saponins) that is toxic to humans resulting in painful stings that can last for hours, as well as nausea and vomiting. As with others in the Echinoderms they are capable of regenerating their arms. Original Distribution: Indo-Pacific, First identified in 1705 by Georg Rumphius, and given a scientific name in 1758. Current Distribution: Acanthaster planci are found on Indo-Pacific coral reefs, the Red Sea and on Australia's Great Barrier Reef. Also infestations on coral reefs in Hawaii, Palau, Guam, Japan, Micronesia, American Samoa, the Cook Islands, Fiji, the Maldives and East Malaysia. Site and Date of Introduction: First outbreak was recorded in the 1950s in the Ryukyu Islands and on Green Island and the Great Barrier Reef in the 1960s. Mode(s) of Introduction: Passive larval distribution traveling in alongshore currents and adult migration. Reason(s) Why it has Become Established: Reduction of main predators, the Triton Shell, Charonia tritonis, due to the shell collection trade, larval predation from coral reef fish has reduced due to overfishing and decimation of coral reefs. Increased outbreaks have been linked to a number of factors from decreased predation , increased nutrient run-off, increased salinity, and increased water temperatures. It is likely that massive outbreaks are as a result of a combination of factors. Algae blooms from increased nutrients increase larval vitality and therefore can lead to massive outbreaks. Ecological Role: Serves as a prey for the following species: Giant Triton shells (Charonia tritonis), White-spotted pufferfish (Arothron hispidus), Titan triggerfish (Balistoides viridescens), Yellow-faced Triggerfish (Pseudobalistes flavimarginatus), Harlequin shrimp (Hymenocera picta), Bristle worm (Pherecardia striata). Predation by these species most often occurs in the larval and juvenile stages, predation of adult CoTs is usually limited to Triton Shells. Captive CoTs are also vulnerable to infection from a disease that causes limb disintegration and resulted in massive mortality scientists are trying to isolate this organism to use in population control. Benefit(s): Crown-of-Thorns are an important part of reef life and a driving force of ecological succession, contributing to coral reef diversity, fossil evidence shows the presence of Crown of thorns, but these outbreaks have increased in number and scope since the 1970's. 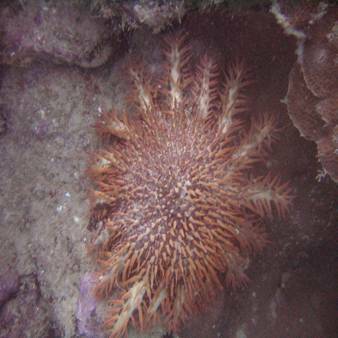 Threat(s): A prolific starfish, the Crown-of-Thorns voraciously feeds on predator upon scleractinean corals, by extruding its stomach over the coral community and externally digesting the coral polyps with their stomach enzymes and absorbing the liquefied coral polyps. They prefer to feed on branching and tabular reef building corals, Acropora spp. Can decimate a coral community already stressed by increased nutrient levels and bleaching episodes due to increased temperatures. Control Level Diagnosis: Capable of massive outbreaks due to free-swimming larva traveling in the water column, they can decimate a coral community quite rapidly and can feed on up to 13 square miles of coral per year. Outbreaks have increased since the 1970's and proliferation has been linked to increased water temperatures and increased nutrient run-off due to pollution. These outbreaks have been divided into two forms, primary outbreaks as a result of changing environmental factors and secondary outbreaks which are as a result of larval blooms. Coral reefs often cannot fully rebound from massive outbreaks, fast growing corals can rebound in 15 to 20 years if no other outbreaks occur and other factors do not contribute to poor reef health. Slow growing corals such as Porites can take up to 500 years to recover. Outbreaks generally last up to 5 years on individual reefs but can last up to 20 on more complex reef systems. Control Method: Almost 15 million CoTs have been either killed or removed from the Indo-Pacific area in the past 15 years, the largest program being in the Ryukyu Islands (Southwest Japan). These efforts are costly and have not been met with satisfactory results. Individual injection with a solution of copper sulphate (formaldehyde, cyanide, ammonia, ammonium hydroxide compressed air, and acetic acid have been also used) to several areas of an individual CoTs (in order to prevent rejection of an arm and regeneration), this method is laborious and expensive. Scuba divers have been enlisted to remove CoTs by hand (carefully due to toxic thorns), or installation of wire mesh fencing to prevent migration of adult CoTs.